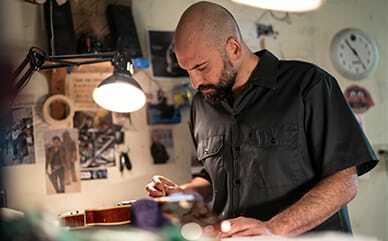 ABOVE: Adam Garcia, from Collings Guitars, layers men's t-shirts under men's work shirts. Look for new shirt styles like the one above this Fall. 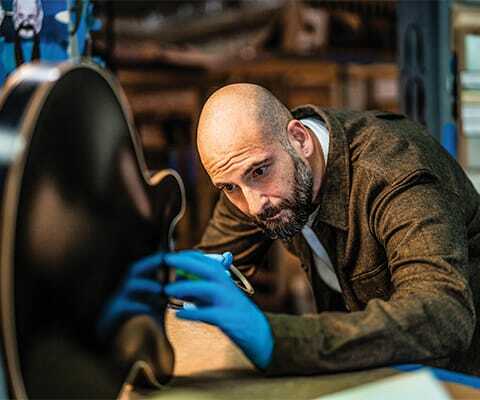 It doesn’t take long when talking to Adam Garcia of Collings Guitars to realize that he is oozing with enthusiasm - about his former boss and Collings Guitars founder Bill Collings, about his co-workers, and about his work. His tone of voice, the words he uses, and the way he pauses to make sure he’s using exactly the right words to describe how he feels about his surroundings all add up to someone who obviously takes great care to impart his passion and affection for the things he cares about to anyone who will listen. Throughout his entire career, Adam has been looking for a place to apply his passion and enthusiasm. He started with his first passion – cars – but quickly found his enthusiasm waning and learning that the rough economy at the time had other plans for him. “I wanted to build hot rods for a living, so I went to school and came out and got a job (like you’re supposed to) and the economy tanked. And that ended up leaving me scrounging for work and getting laid off. It was a huge pain,” Adam said. It didn’t take long to land at Collings Guitars, though. 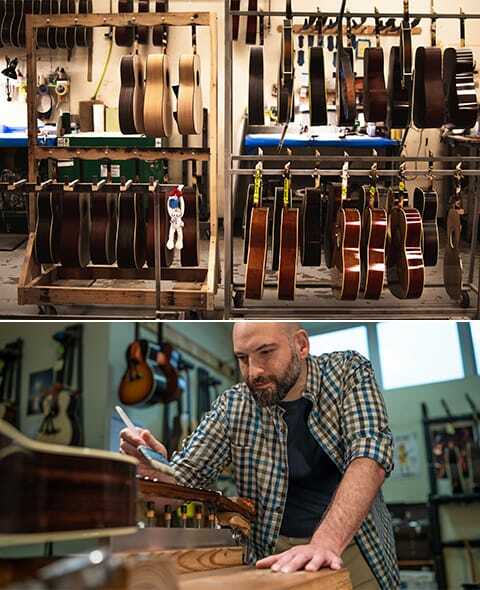 A simple search on Craigslist for the word ‘guitar’ returned exactly what he’d been looking for – a job listing that seemed to be tailored to his exact specifications. He applied immediately. “It was very fate-esque,” he describes. From assembly to finish, Adam lets the wood speak to him, so he can create guitars with custom final looks. Check out men's work shirts like the one Adam wears above. Adam has been at it ever since, going from buffing guitars to eventually working to be the one to actually paint the guitars themselves. Listening to Adam talk about what he does and why he does it, it’s obvious he cares immensely about how people connect with the instruments he helps customize. In fact, it’s when he starts talking about the shop’s clients and the people he works with that he really starts to let his passion show. “Before you ever play it or hear it, it’s what you see, and that’s our job to roll out the red carpet and make the guitars look like they’re supposed to look,” he explains. Adam makes his final brush strokes before calling his guitar complete. Find new button-down shirts like Adam’s this Fall. It’s nice to know that the people who buy our instruments cherish them. And it’s not some beater that they don’t care about. It’s a privilege to work here. The legacy of Bill Collings is also something that Adam has infectious enthusiasm for. 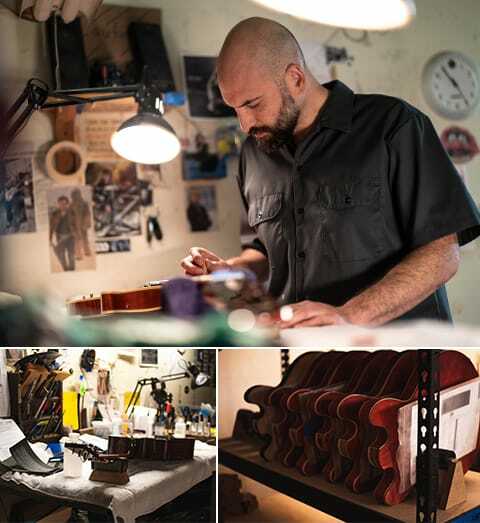 He describes it as something that permeates the culture at Collings Guitars and as something he is compelled to – along with his coworkers – pay forward every day. “Bill was such a bigger-than-life… I don’t even have words for it. He was motivational and inspiring on so many levels. The whole idea of ‘if you’re going to do something, be the best’. Don’t kinda do it. If you’re gonna do it, do it. Don’t waste your time. We don’t have a lot of time on this earth. Part of excelling at his craft is knowing the limitations of color and product. Check out the work apron Adam wears while painting. We want to continue the essence of Bill. We all have a piece of it and a bit of knowledge and when we combine it we continue to produce what he started and with the same ethic and the same culture. We’re second-generation Bills. It’s up to us to share and keep that culture going. Comfortable men's jeans designed to last. Durable t-shirts that protect from the elements. 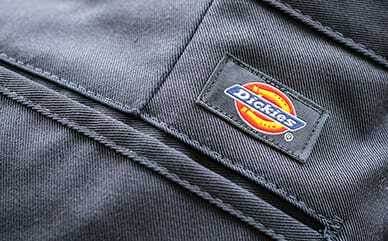 A variety of cargo pants designed to meet your needs. Functional work aprons and tool bags for every project.